When it comes to the three most important words in real estate – location, location, location– it doesn’t get much better than Port Imperial. This stretch of the Weehawken waterfront offers unbeatable views of the Manhattan skyline with convenient ferry access to Midtown. A multi-billion dollar redevelopment by Roseland, a subsidiary of Mack-Cali Realty Corporation, is under way at Port Imperial. 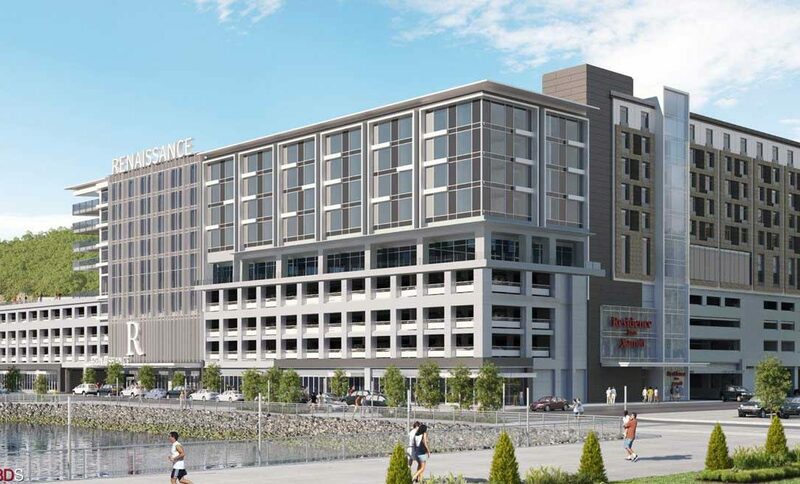 The centerpiece, dual-branded Marriot hotels with partners XSS Hotels, will be built over the existing 850-space parking garage. The 210-key Marriott Renaissance and 154-key Marriott Residence Inn will be connected by a sixth-floor sky lobby. They will share access to an outdoor terrace overlooking the Hudson River, event space, outdoor pool, fitness facilities, and an upscale restaurant, as well as 17,000-square-feet of retail space on the ground level. The luxury hotels are among the many high profile projects Construction Pros of NJ introduced to its portfolio in 2016. Construction Pros of NJ has found a comfortable niche in the hospitality sector. Other hotels in the portfolio include a new Embassy Suites within Connell Corporate Park in Berkeley Heights (opening Spring 2016) and a Fairfield Inn in North Bergen. The Port Imperial hotels are anticipated to open in late 2017.